Stars and coma: Capturing stars as points of light is a challenge in optical design. 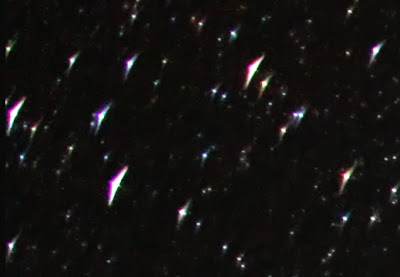 Without the addition of special aspherical elements, stars and other points of light are often reproduced with great distortion, particularly near the edges of a photograph. This lens aberration is called coma. Stopping down the lens to a smaller aperture can overcome some of this distortion, but not all of it. Surprisingly, very few general photography lenses come with coma correction! A disappointing experience: Since the typical photographer rarely photographs subjects that require coma correction, most general photography lenses do not incorporate aspherical elements in their lens designs. 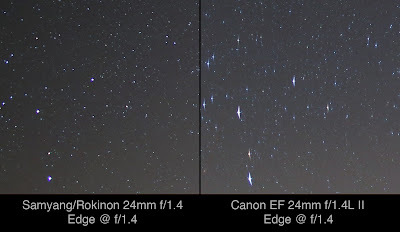 For this reason, I was quite surprised when I spent $1,800 in 2011 for one of Canon's best 24mm lenses, only to be extremely disappointed with it's wide-open performance when photographing stars (the lens works great for everything else). The Canon 24mm f/1.4L II lens seemed like the perfect answer for my star photography. All the reviews I read said that it performed well, even wide open, with only moderate vignetting (which is important when you want to stitch several images together into a panorama). By being able to shoot at f/1.4, I could lower my ISO and greatly reduce the noise I had been getting in my starry night skies. Canon 24mm @ f/1.4: enlarged area near the edge shows stars with severe coma distortion (click image to enlarge). 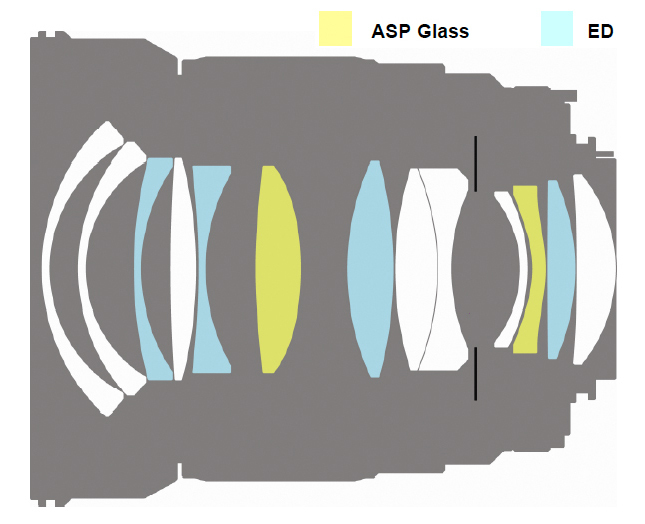 Samyang Optics to the rescue: Canon and Nikon have chosen to make only a few prime lenses with aspherical elements that control coma. Over the past year I have discovered there is a manufacturer that does make fast prime lenses with aspherical elements, and at inexpensive prices: The South Korean optical company, Samyang Optics. Samyang produces three wide-aperture aspherical lenses under a variety of brand names (Rokinon, Bower, Samyang, and ProOptic). These lenses are often one-half to one-fourth the price of Canon and Nikon lenses with similar focal lengths and maximum apertures specifications. The Samyang / Rokinon / Bower lenses that I recommend for starscape photography are the 14mm Ultra Wide-Angle f/2.8 IF ED UMC, the 24mm f/1.4 ED AS UMC Wide-Angle, and the 35mm f/1.4 Wide-Angle US UM. All three have the largest apertures in their class, and all three have aspherical elements. Manual everything reduces their cost: What makes the Samyang lenses so inexpensive is that they lack all of the automatic features we've come to rely on, i.e. auto focus and electronic coupling with our digital cameras. However, none of these features matter much to an astro-landscape photographer. Auto focus does not work on a night sky, so we must resort to manual focus, anyway. Lack of auto aperture (where the camera stops down the lens' aperture to the preset aperture value) is of little concern when you plan to use the lens wide open. Recommendations and Reviews: Several of my night photography friends have purchased these lenses and recommend them. For example, Masahiro Miyasaka (Astrononomy Photographer of the Year 2012) uses the 14mm; Mike Berenson uses the 24mm; and David Kingham uses the 35mm for awesome panoramas. I have the 24mm and the 14mm. The Samyang / Rokinon 14mm has a 114º angle of coverage, and produces awesome vistas of the Milky Way. It has so much depth of field, even at f/2.8, that some have difficulty focusing it, but its worth the extra effort! It has a little more barrel distortion than than the $1700 Nikon 14mm f/2.8D ED, and more barrel distortion than the $2400 Canon EF 14mm f/2.8 L II USM. Both the Canon and the Nikon are excellent choices for architectural photography, where it is important to maintain straight lines, but you're probably not going to notice this too much on landscapes and starscapes. Here is a Digital-Picture review on the Samyang 14mm. 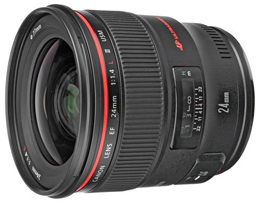 The Samyang / Rokinon 24mm is a favorite lens because of its 84º angle of view, its fast, f/1.4 aperture, and its excellent correction for coma and fringe color. For starscapes, I would actually prefer the wider coverage of the 14mm, but its slower f/2.8 aperture gives overall preference to the 24mm. A Flickr contact of mine, Rick Whitacre, did this coma comparison between the Canon 24mm f/1.4 and the Rokinon 24mm f/1.4 (here's a 260% larger view). Rick did other tests on sharpness, brightness, and vignetting starting here (click image to view all sizes). Nikon users will want to see this LensTip coma comparison between the Nikon Nikkor AF-S 24 mm f/1.4G ED and the Samyang 24mm. Here's a Digital-Picture review on the Samyang 24mm. The Samyang / Rokinon 35mm is probably the least purchased starscape lens because of its narrower 63º angle of view. However, because it has a less distorted view (closer to that of a normal lens) than most wider angle lenses, it is preferred by many photographers for panoramas, where several vertical images are stitched together (like this one by David Kingham). Here's a Digital-Picture review on the Samyang 35mm. NOTE: All of these lenses are designed for full-frame camera sensors (i.e. a Nikon FX). They can be used on a Nikon DX camera or a Canon camera with an APS-C size sensor, but the angles of view are less. The angle of view with the 14mm becomes 94º using the Nikon APS-C sensor, and 90º using the Canon APS-C sensor. The angle of view with the 24mm becomes 62º using the Nikon APS-C sensor, and 58º using the Canon APS-C sensor. The angle of view with the 35mm becomes 43º using the Nikon APS-C sensor, and 41º using the Canon APS-C sensor. Here is my first article on Overcoming Coma. I have Rokinon's 8mm f/3.5 lens. I have to say it's fun working with manual lenses. Kinda inspirational. This is why I love to read your blog. Great advice. I was thinking of buying Nikon's 24 f1.4 until I read this article. Instead I ordered the Bower from BH and saved $1500. I've read about the distortion on the Samyang/Rokinon lenses. What do you think about the Tokina 11-16mm f/2.8 AT-X116 Pro DX Digital Zoom Lens instead ? It's about $600 vs. $400. I'm not sure which lens you are referring to when you mention distortion. I've given links to the distortion concerns on the 14mm. As for the Tokina 11-16mm f/2.8 AT-X116 Pro DX lens, this is somewhat like comparing apples with oranges. All the Samyang/Rokinon are prime lenses and designed for full-frame sensor cameras. This Tokina is a zoom lens and will only work on APS-C sensor cameras. Zoom lenses are great because they cover the range of several prime lenses, but they can be a compromise in some areas. This Tokina zoom is one of the better zooms out there, as it has a constant f/2.8 aperture. The 11-16mm zoom range (a full-frame equivalent of 16.5-24mm) is a good wide angle range for starscape photography. Several reviews rate this lens as the fastest and sharpest ultrawide lens for small format digital cameras, and consider it a bargain for under $600. The big question for the starscape photographer is how does it perform wide open on points of light (coma aberrations)? 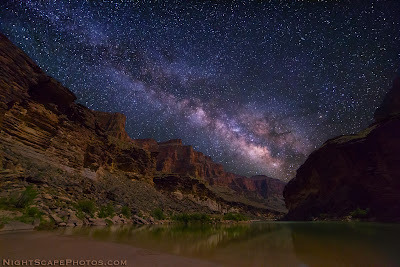 Find out for yourself by going to a pool of images taken with this lens: http://www.flickr.com/groups/tokina11-16mm/ (60,000+ photos) -- then search within the pool on something like "milky way". Check for EXIF data and review those photos that were shot at f/2.8. Check the corners of the images on those that allow large sizes to be viewsed. I look at several and was pretty impressed with what I saw. Ryan, I use the Tokina 11-16mm on my Nikon D7000 and have been able to capture some fairly decent night sky images with it. 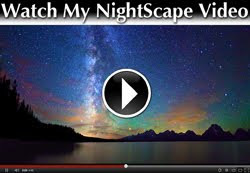 Mind you they are not the quality of Royce's work, but for me it has been a great landscape/night sky lens. I do own the Rokinon 8mm but have not really used it enough to determine if it is a better night sky lens at this time. Thanks for the very helpful info, guys. RE: distortion, I was referring to the Samyang 14mm, for example see this review. Of course, I realized my mistake about the Tokina 11-16mm not being full frame as soon as I posted my comment. I have a 6d, so a full frame lens is important for me. I'm looking for a good general purpose wide angle lens that I can use for starscape, landscape and architecture, and doesn't cost me an arm and a leg. Perhaps the Rokinon is the one, and I can rent more expensive lenses when necessary. I'll look for examples on flickr, thats a great suggestion. I don't believe it does much about Coma Aberration though, which is, of course, what this article is about. I am definitely looking into the 24mm f1.4 thanks to this great article by Royce. Thanks for leaving this comment, David. I highly recommend your article! I dont own the Tokina 11-16 2.8 but have had a good look into buying it (i wanted and ultra wide for my 1d4), it is usable (but look into this yourself) on any canon body although it says it is for ef-s. It is not usable at 11mm without vignetting apparently its good from about 12.5mm. Royce id have a look at this one as well might be a good slightly wider option. I have a 14/2.8 Canon and the Mark II--is this a workable combination. Or do I need to purchase--maybe the 35mm/1.4? I am really looking forward to this upcoming event. I think what you have is very workable! Glad to have your comments finally here, Randy! As for the cropped sensor and low coma distortion question: Your APS-C crop will eliminate the worse portion of the coma aberrations from ANY lens, including vignetting problems. You can see those crops in the Digital-Picture reviews linked above for each Samyang/Rokinon lens; however their reviews do not reveal were the worse coma is. I can tell you though that the worst is always outside the APS-C crop! So you will benefit from using the lens on your T2i. I would stick with the wider lenses (the 14mm and 24mm, and ignore the 35mm) though, as the crop will also reduce your angle of view. I couldn't agree more! I've been very happy with my Roki 14 and 24mm lenses. I love how you showed the visual comparison with the coma effect both in the center and toward the edge. Fantastic article, Royce! But I am looking forward to getting the Samyang 10mm f2.8 when it is released later this year. I noticed you forgot to include links to Pentax mount. A note I don't see here, although the wider angle lens has a smaller 2.8, its worth noting that the further "zoomed out" shots will travel less in the frame (star trails I mean), and you can simply force a lower ISO with a longer shutter. I don't notice star trails on my 15-85 at the 15mm range until about a minute exposure, in which case ISO 800 works fine for me. 15mm on a 15-85mm is equivalent to about 24mm on a full-frame sensor camera (about 84º angle of view). You may not notice any star trailing in your one-minute exposure until you enlarge the image more. However, you are correct in that the wider your lens' field of view, the longer the exposure can be, and hence, the lower ISO you need. "600" rule: most astro photographers follow this rule, which is to divide 600 by the focal length of your lens (it's 35mm full-frame equivalent) equals the maximum time in seconds that you can expose without getting significant star trail movement or blur. (example: 600 / 24mm lens = 25 seconds). This was very informative. I have a Nikkor 20mm F2.8 but the coma is pretty bad. I've been researching ways of software-based coma correction (that don't involve cropping but would likely involve slight blurring) but I had not considered the Samyang 24mm F1.4. Read the above post to see how to properly focus this lens. This example is for the Canon mount. Nikon and Sony mounts may be slightly different. Test your lens in the daytime at f/2.8. Use a scene that has detailed objects at 5, 10, 20, 30 feet, and at infinity. Shoot wide open. Mark your lens barrel where infinity looks the sharpest at your focus setting. There are other lenses that are a little sharper at this focal length than the Rokinon, BUT they have awful coma problems with the stars (as points of light), so this lens is a great compromise and value at only $350. The only other lens I have tested at this focal length that is sharper AND and has good coma correction is the Nikkor 14-24mm f/2.8; however, it is also about $1800 to $2100, depending on where you buy it. I have bought the Sangyang 14mm UMC and am also considering the Sigma 10mm f2.8 EX DC HSM Diagonal Fisheye Lens. It also has brilliant coma scores. 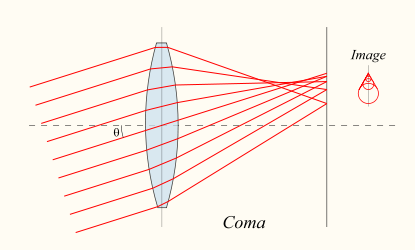 I have found a super site which I have found very helpful with lens reviews particularly determining coma values with diagrams. Any ideas why the Bower version is significantly cheaper? I picked one up from B&H as they are going for $299 now, though the differences in pricing/branding is slightly concerning. Also, I've heard these lenses often have decentering or unusual softness issues, and several copies have to be tested. Did you have issues and had to replace for another copy? Thanks for sharing the info. I bought the Bower version of the 24mm f/1.4 and it was terrible and not just for night shooting. I returned it and got the Rokinon version which was about $100 (+-) more at B&H and it seems very sharp, especially compared to the other. Just a quality control issue as I've heard mentioned? I know this is a little late, but what about the Nikon 14-24 f/2.8..I have not noticed any distortion nor heard any but a coarse I have not done the analysis you have with the Bowers/Rokinon. what ISO are pictures showed here? (beautiful, by the way) thank you very much!! 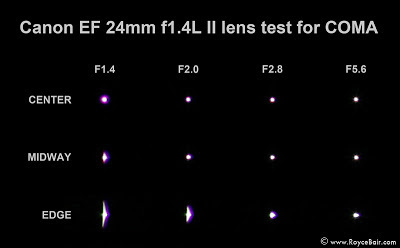 Until recently, I have been using the Tokina 16-28 f/2.8 on a Canon 5d2. Great lens, but has coma. I just bought a Rokinon 14mm f/2.8, and couldn't believe how strong the vignetting was. Easily at least 2 full stops darker than the Tokina. Even worse, the vignette extends almost to the center of the frame, making the entire image appear at least one full stop darker than the Tokina. I'm not sure the lack of coma is any better than the strong vignette. You can always take a flat frames and remove the vignetting in post. Especially easier since it's a prime lens. Hey Royce, Thanks for this great post. Wanted to get your thoughts. Here's what I currently own on the wide end: Zeiss 15mm f2.8 and Zeiss 21mm f2.8. I absolutely adore this glass. But I have two issues. My main goal here with this question has to do with getting two shots: A nice rich Still of the Milky Way and a nice crisp Time Lapse of the Milky Way. Now I'm backpacking, so there's two factors to consider here. 1 is weight, ideally I just bring in one lens. 2 is expensive glass, I may want to avoid bringing super glass out, especially when there may be Korean glass at 1/6th of the price that performs better for the tasks that I've mentioned. Naturally, the Zeiss 15mm seems like a no brainer, and I'm not opposed to carefully packing it and leaving it out over night. But recently, I've been getting very very itchy to buy one of the Rokinon 24 f1.4. It's just getting slammin' reviews. And at the cost of $425ish used and $550 new, I may just grab one, knowing that when I leave it outside of my tent all night, and a bear eats it, no problem. Not so for the Zeiss 15mm. 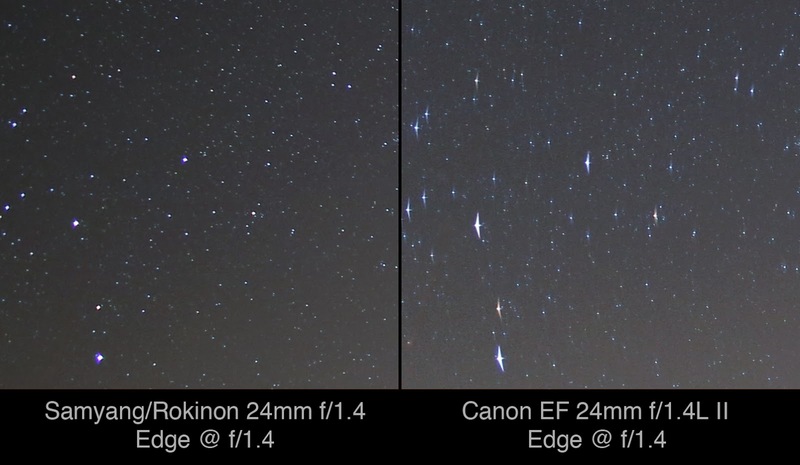 I'm seeing this Night Sky Lens Calculator floating around in the forums that rates Rokinon 24mm f1.4's light collection ability for it's clear aperture at the very top. This is seems to me to be the best fit for getting a great shot of the milky way, maybe less so the time lapse. I think I'd be willing to sacrifice a little FoV for being able to bring out Purple and Green clouds in the milky way, you hear me cluckin', big chicken? Sorry for the delay in getting back to you, "Old World" —I've been in the field for the last 10 days (and have only answered the most urgent of text and direct emails). Those two Zeiss lenses are top-notch. The Rokinon 24mm f/1.4 is amazing. I shoot it at both f/1.4 and f/2.0 (less vignetting). 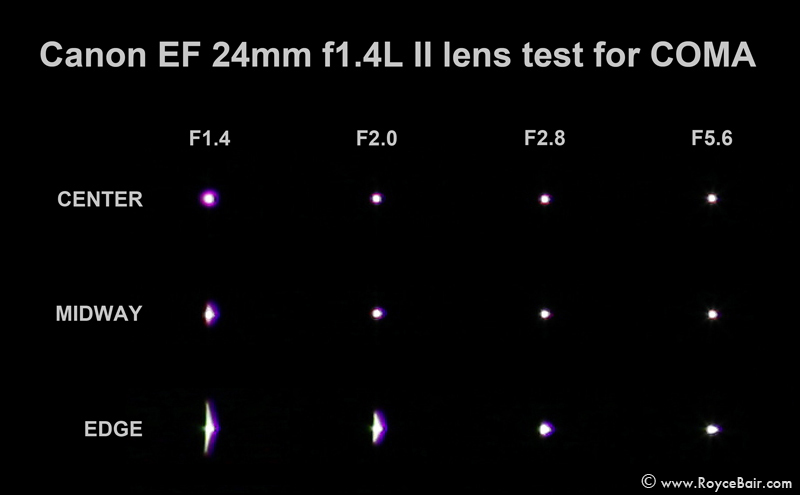 No other lens I've tested collects as much light and produces as sharp of stars. Go for it! Thanks for this article, I was wondering why you don't mention the Rokinon 16mm f/2.0 lens, a little narrower than the 14 but a little faster. I bought the Nikon 20mm 2.8 lens for my Nikon 610 full frame. I was horrified by the coma abberation. At just 200%, the results of any hard line or subject looks like a misaligned 1980s 3-tube video camera at anywhere except dead center. Calling Nikon produced a lot of hemming and hawwing but finally they admitted that the sample image I sent them was normal for this lens. I'm in the service, in Saudi Arabia so I can't return the lens. What a disappointment! Royce are these still your favorites? or have a new one/ones come onto the stage? Hey Royce, will you be trying out the new Tamron 15-30mm f/2.8 VC? It seems like it may be a real winner. It has the fast aperture, wide angle, and it zooms, all for half the price of the Nikon 14-24, and it auto-focuses on canon camera. Also based on Dustin Abbots review it has greater light transmission and significantly less vignetting compared to the Rokinon. 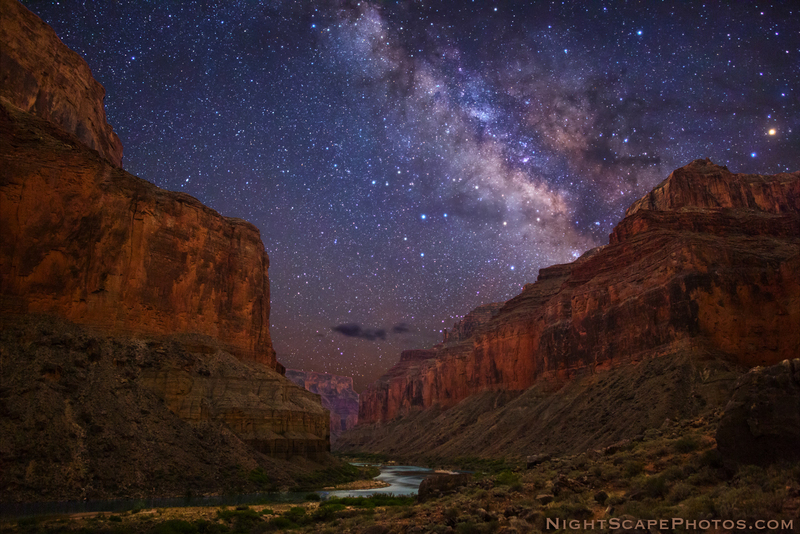 I'd love to see a dedicated astrolandscape photographer review this lens! This information is just terrific, Royce. I've got a question about how you deal with noise generated by the high ISOs required to grab an exposure before star trails begin. Do you use stacking/aligning software to cancel out noise? Thanks! Royce, there is not a link on your blog to give you the 2% referral commission on the Rokinon 12mm 2.8 lens. I'm about ready to buy. Royce, have been following you for a long time on Flickr and have really enjoyed your progress...stunning pictures. I will be going to west Texas to make some night shots for the first time. I have ordered a Rokinon 12mm 2.8 lens to use on my new Sony a7MII. Any comments on this lens? Found this article by accident and it really was informative. Thank You! Only recently started to photograph night sky and obviously running across same issues as other people who are learning to do it. I have Samyang 8mm f3.5 (among other lences) and I am experiencing this coma with it also some. But only visible when zooming in. But will now test after dropping the A a step or 2. Royce, have you or any one you know used the Nikon 20mm f/1.8 to know how well it reduces coma? James, lenstip.com ....20mm f/1.8 has some lame coma happening. Although, Royce...I'm torn - could you help? Rokinin 24mm 1.4 or the Nikkor 14-24 2.8?? Lenstip.com didnt really give that raving of a review regarding the coma and the sharpness at 1.4 didn't seem too stellar either. Maybe they just had a lemon? Great Photo editing apps for Instagram? I learned so much by reading this blog! I wasn't even aware of coma. Thanks so much for sharing!!! Looking for an online game App? Is the lack of aspherical elements really the cause of coma? My Sigma 20mm f/1.8 EX DG as bad coma on bright stars but it has aspherical elements (see https://www.sigmaphoto.com/20mm-f1-8-ex-dg-asp-rf). Photo Booth Hub to reserve a photo booth for our vow renewal and I have to say they are AMAZING. It was such a seamless experience with the ability to search by location, budget, date and type of booth. thanks for your posts i really like it! Thanks for the very interesting and detailed review!! I was debating the 24mm Canon, but want to use it solely for astro so I will probably get the 24mm Rokinon to match my 14mm Rokinon for those purposes. Have you heard anything about the new sigma lenses? I dont own any, but some are saying the 20mm f 1.4 is the best astro lens thus far. Thoughts? drdavismartin62@gmail.com or add him on WhatsApp via this number +2348077210007. Very nice information. If you are looking Bed Linens, please visit by Adab online Store. Wow, this is the best site that I have visited today and I have gain a lot of new knowledge about the night photography and I am thinking of changing my career from being a professional editor with Thesis Proposals Reviewing Help Site to becoming a professional photographer so that I can capture every moment of the nature especially at night. Very informative article..Thanks for sharing this. Buy Nikon D3300 Online for better photography. I can live like every normal human and I can eat any food of my choice If you need such help.. This is really an invalid question and makes no meaning. First. A Canon lens will fit Canon camera body only and same for Nikon (unless some lens adaptors are made for each other). Second. What wide angle lens are we talking about? What focal length? Is it Prime or Zoom? A wide angle prime is available from Fisheye 7.5 mm to 40 mm. Wide angle zooms are available in many ranges. How about the 12mm Rokinon? I am a beginner. Should i go for the 12mm or 14mm? Believe it or not, commercial product photography is actually a good deal more complex than simply propping a product up against a sheet, pointing a camera and pressing a button. In fact, product photography is both an art and a science, requiring ingenuity and imagination, scientific know how and cutting edge technology. This article has been designed to help Brides and Grooms make the right decisions when choosing their annabel singapore After all, you will have to look at your wedding photographs for the rest of your lives, it is best to spend some time choosing and researching your photographer. This article contains 12 questions and answers that will help couples on their path to choosing the right wedding photographer for them. I Always Follow Your Blogs, share your Instagram i want to follow you on instagram. following are mine pls check and give some suggestion thanks! Canelo vs Jacobs Boxing Match Will be held on 4th May 2019 in Las Vegas. Canelo Alvarez is ready to fight with the another big boxer Daniel Jacbos. It will officially streaming on DAZN. This kind of clash is very rear to seen. How to watch Canelo vs Jacobs Live Streaming On DAZN, Here is given the full gudline.You can enjoy the bout problem free. Install Tutuapp iOS on iPhone and download apps and games form the unofficial App Store.